As of 9/6/2011, we have brought this topic back to it's original place in Music General. As of 9/1/2011, you do not have to be a member of Soulful Planet to respond to this topic. We will keep this thread open to guest posters for a short while. If any of our members have objections to this, please let us know. Yes, we had fun in 1974/1975! Oh no Geno... I can only imagine what's up with this. Yes... Please let us know. Great Pride - "She's A Lady"
for MGM Records - and John Mazzacano (Mgr-not pictured). I know it's in your best interest to be cryptic right now. Thank you for putting this thread up; because I know that as the days progress, it will be of value to everyone to see how things unfolds. Be certain that if "somebody" doesn't do THE RIGHT THING, in a REASONABLE AMOUNT OF TIME... I'm sure we'll all be happy to help clarify this situation globally. "I'm with ya Geno. the good thing is that I got to hear this track and I never may have otherwise. THIS IS AWESOME !!!" Ted, Thank YOU! 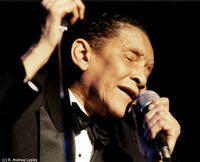 I was 22 years of age when we (Great Pride) composed and recorded "She's A Lady" for MGM Records and performed it live out on the road, and it's release was often refered to in the press and radio as being "way ahead of it's time", and it was very influentual in accelerating my career in Music. 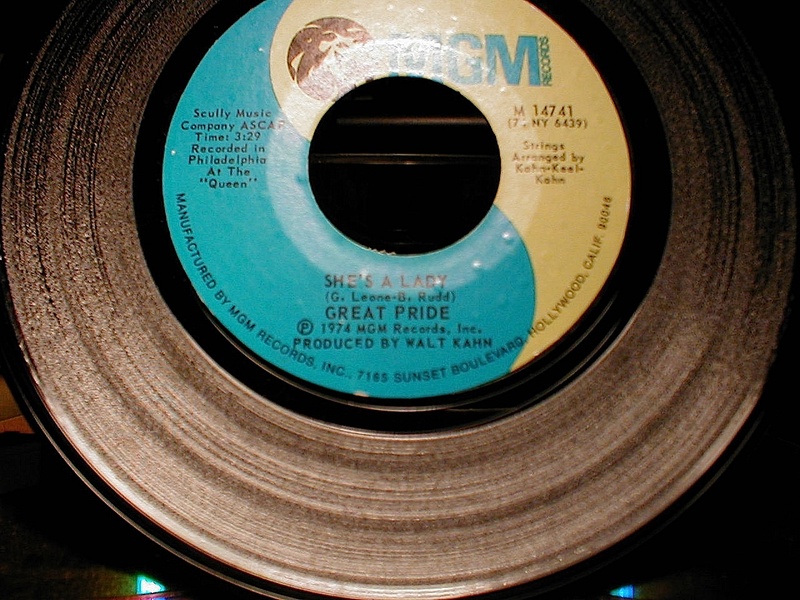 Obviously, Great Pride - "She's A Lady" is VERY SPECIAL to me. ... but this is only the begining of this story, and what came to light on Christmas Eve 2010, during an unrelated phone conversation with my dear friend Kathy Valley, who happened to look up "Great Pride" on YouTube... leading to someting that was done involving "literal use of the recorded performance and song" of "She's A Lady" back in 2007 by a GLOBAL MAJOR ARTIST that I very much respect, on a EPIC/SONY MUSIC as a Major Label release that went Double Platinum in Russia, etc., ... that previously, I have had absoultely no knowledge of it's existence, it's use, or it's modification to this very moment... of OUR ORIGINAL WORK! But how would I have known about this, except by random discovery... I was never contacted. 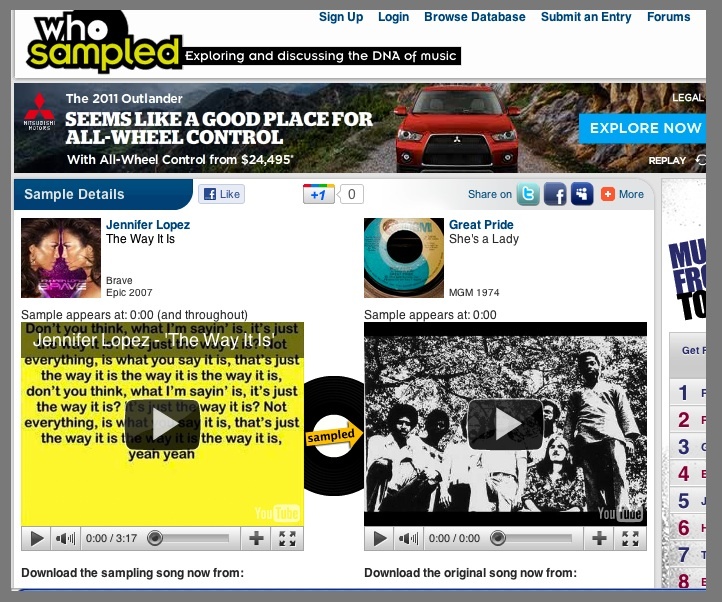 Our song "She's A Lady" was re-edited, 99% of the original performance credits and musician credits and publisher credits on Great Pride - "She's A Lady" were stripped away, new "writers' and "lyrics" and "producers" were added, and the "song title" was changed and re-registered on BMI... not ASCAP!!!!!! maybe they just thought we were all dead by now! Listen & Compare! Oh, What Fun! Scully Music Co ASCAP /Sunshine MGMT & John Mazzacano (Band Mgr). OH MY!!! Sounds like Jenny from the block has set a new standard as a judge on American Idol. Best of luck with all this, Geno. You wrote it, and played on it Geno. Jennifer Lopez used it... not just a small part of it either... on a multi-platinum selling album... and you have not received a cent for it. That's really horrible! Good direction Dream... Maybe the Idol people would enjoy being made aware of this. How encouraging would it be, to an up and coming star, to be judged by somebody like that! I hope for her sake, she was unaware of this obvious wrongdoing, and will make it right. If they can't settle this properly between her peeps and your peeps, a little public embarrassment never hurts - your cause. The producers of "American Idol" will not want any scandal and shows like "Access Hollywood" & "Entertainment Tonight" & "The Insider" are always looking for stories like this. I think all will go well for you, Geno. fan made video, "instrumental version"
~Geno aka. Gene Leone, aka Gennaro Leone aka Gene_Leone_Mix! p.s. As of this writing (1/02/2011), not one official notification in any way shape or form, or royalty, or payment in any form, has come to me (Gennaro Leone, Gene Leone, Gene_Leone_Mix, or Gene Leone Music) about my song, my drum performance, my band's preformance of "Great Pride - She's A Lady", being "Literally" used for more than 3:07 in Jennifer Lopez - "The Way It Is", on the BRAVE CD, selling 800,000 units to date worldwide since 2007, from ANY SOURCE- MGM, EPIC, SONY, BMG, ASCAP, BMI, SoundExchange, RIAA, or the US Copyright Office, etc. Obviously, yet another part of the "Major Label Music Industry" is clearly broken. to hear..... Somethin' ain't right here ! "I originally heard this back in 2003 when I got booted on a strange, one-off 12". Even then, I remember it being some really crazy stuff but I had forgotten about it for years until recently, when I grabbed an OG copy of the 7". It's such a fantastically quirky song that mashes up some funky white dude rock, lush orchestral production and crazy psychedelic vocals. Call me crazy but didn't the moment where the strings and beat come together at :15 remind you of this? Far as I can tell, this was the only release this 7-man band ever put out; pity - I would have loved to hear what an entire LP's worth of material sounded like from these guys." Thank You! 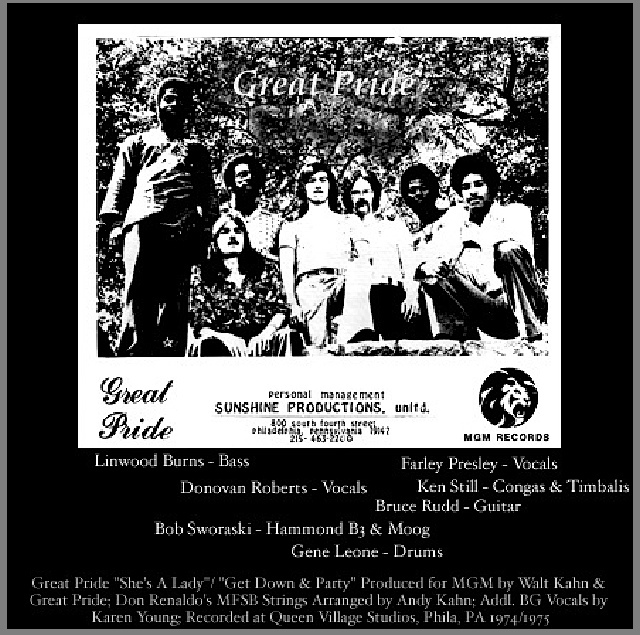 - "Great Pride" - "She's A Lady" Musician & Performance Credits: Gene Leone (Drums), Bruce Rudd (Guitar), Bob Sworaski (Keys), Lynwood Burns (Bass), Ken Still (Congas), Andy Kahn (String Arrangements w/Don Renaldo MFSB Strings), Farley Presley (Voc -RIP), Donovan Roberts (Voc), & with Karen Young (additional BG Vocals )... 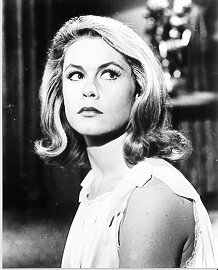 Produced by Walt Kahn at Queen Village Studios in Philly, PA for MGM Records - Scully Music Co ASCAP /Sunshine MGMT & John Mazzacano (Band Mgr). 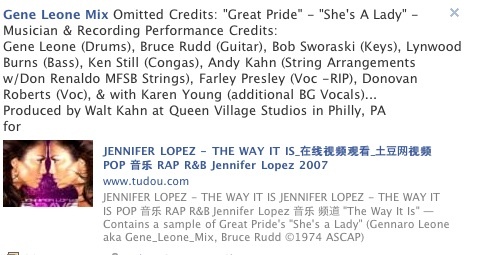 Also, Great Pride's - "She's A Lady" (1974) was extensively "literally" sampled on Jennifer Lopez - "The Way It Is" in (2007)(As of 2011, The Members. Writers and Musicians of Great Pride have yet to be formally notified, or compensated or properly credited for their performance that was "sampled" in J.Lo's BRAVE CD, or This "Dusty Fingers Volume 16" release. Just read this. You need to put your royalty lawyer on this, you'll get's what due. In my world, and in a strange way, this is not so much about "getting anybody". Clearly, a mistake was made here, omissions were 'ooopsed' here. fairly and honestly to all involved. Will this happen? At this moment... I still do not know. 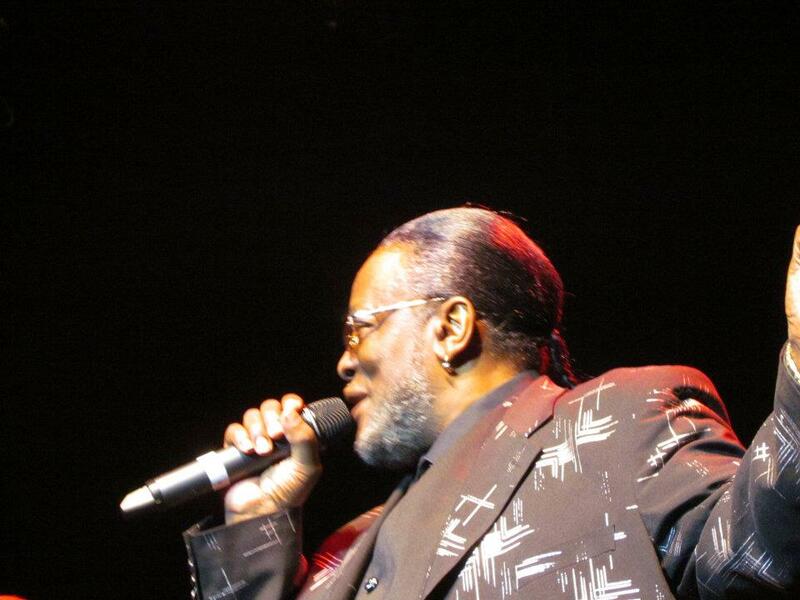 I know that our buddy, George Clinton is going through a similar situation of things that "ooopsed & happened"
in the Major Label Music Indusrty in 2007 with the Black Eyed Peas and the "literal sampling and use" of his works, also. Doing what is what is ethical, what is fair, and what is honest to ALL involved solves the problems. concerning the "literal use", "song use". I think her camp is waiting for you to sue them. they will work pro-bono to get you your dues. she will be forced to deal with it. Go for it, Geno. Don't hold back !